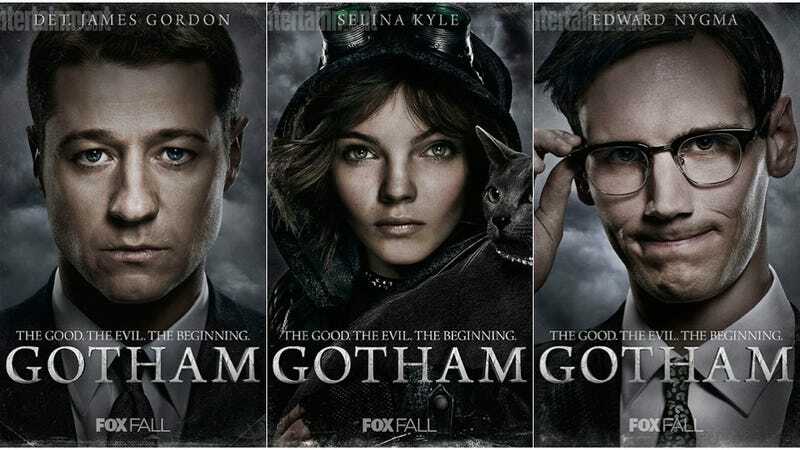 There's a lot to like about these great new character posters from Fox's upcoming Batman prequel TV series Gotham. The ridiculous new name of the girl who will grow up to be Poison Ivy, however, is not one of them. I actually think the casting here is pretty spot-on, and everybody looks great as their respective characters. Sure, the kid who plays Bruce Wayne kind of looks like he's computer generated for some reason, and Donal Logue's Harvey bullock seems like he's literally minutes away from dying, but that's not that big a deal. We knew — or at least feared — that the character known as Pamela Isley in the comics would be renamed Ivy in Gotham, as we saw in this leaked early draft. And that's pretty terrible, because having a character named Ivy who eventually decides her supervillain name will be Poison Ivy is the sort of lame comic book nonsense that went out of style in the '60s. But Ivy Pepper? Was Ivy Plant too on-the-nose for you guys? Maybe Ivy Greenthumb? What the hell was wrong with the not-completely-obvious Pamela Isley? She's introduced in the show in an apartment full of houseplants, after all. I think people could make the association without her named being "Ivy" without the show figuratively beating us over the head. Oh well. I suppose it could be worse. They could have named her Ivy Posehn.